I realize that it is almost the end of September and most people have been back in school for at least a month. This was originally meant as a back to school post, but I think it still works! Back to school, or the beginning of fall, is a great time to make some resolutions and goals. I love to start the year off with a list of goals I would love to accomplish. Sometimes that list is only 1 or 2 items long and I add to it as I go. Whether you start with a short list or a long list, setting goals is super important! If you’re intimidated by goals, start small. Start with 1 or 2 small goals. It’s super important to write down your goals. When you write them down, you are committing to them! 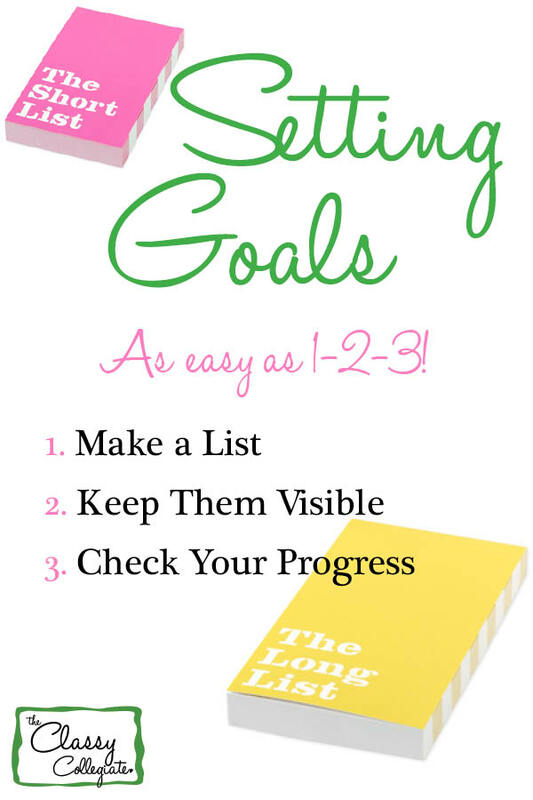 I love the Kate Spade Short List or Long List for writing down goals! If you have a tendency to forget things, keep your list in a place where you will see it often! Try a desk drawer, inside your fridge, on your mirror, or on the back of your door. Seeing your goals every day (or close to every day) will keep you reminded of them and focused on accomplishing them. Every two weeks or so, I like to sit down and think about the progress I’ve made on my goals. Sometimes this isn’t necessary with smaller goals, but it is definitely necessary with big goals. If you are trying to accomplish something super big, break it down into smaller, more manageable goals and set a timeline for accomplishing them all. One of my big goals (only big because I find it so hard to accomplish) is trying to read for fun! I get so caught up with my school reading that I forget to read for fun beyond my google reader. I’m trying to incorporate an hour of reading every week. Is one of your goals to read as well? Check out this Levo League Article on how to make time for reading. What are you goals for the semester or the year?